After settling in Chiang Mai for a few weeks I feel like I’m finally getting this Thailand thing down. I’m a little late to the game though since I leave for Burma in a few days, but better late than never, right? Overall, Thailand wasn’t my favorite, but of the cities visited I found Chiang Mai to be much more up my alley. The cafes are plentiful, the mountains surround you, caves and waterfalls abound and vegetarian food actually exists (take note Bangkok). The longer I was there, the more gems I stumbled upon, so without further adieu, I present The Top 10 Things To Do in Chiang Mai (according to my humble opinion, of course). 1. MUANG ON CAVE (25 mi. east; 30 baht). Incredible cave and short thigh-burning hike! It is decently lit inside so skip the lantern rental, but do be prepared for a lot of stairs and narrow areas. 2. BUA TONG STICKY FALLS (35 mi. north; Free). This was my favorite adventure! How can it not be when you get to soak in a little lagoon at the bottom and then prance up and down waterfalls? The rocks are “sticky” (aka limestone and other scientific hoopla) which makes climbing them possible. If we had brought lunch and beers (rookie mistake) I could have easily spent a good part of the day there. 3. GRAND CANYON (11 mi. sw; 50 baht). Well, Thailand’s version of the Grand Canyon that is, which means it’s a former quarry that has been filled and become a big tourist attraction. We jumped 50 feet off a canyon wall into the warm water below and swam to bamboo rafts where we lazily floated. Since it’s the rainy season it is decently safe to jump, but I wouldn’t do it in the dry season. Fear not, you can also wade in if you aren’t the average risk taking jumping Joe. The view and the vastness of this place is worth a trip in itself. 4. SANTISOOK DOG & CAT RESCUE (13 mi. east; Love don’t cost a thang). Looking to have your heart broken and repaired all in one convenient location? Look no further! I’ve been volunteering here for a few weeks and couldn’t recommend it more. Even if you only have a few days to offer, or if you’re in the market for a unique and one-of-a-kind fluffy souvenir, you should stop here. Santisook cares for abandoned and disabled animals and their work makes a world of difference to all the 4-legged (and 3 and 2-legged) friends. How can you resist all the potential warm and fuzzies from cuddling baby kittens and energetic little pups!? 5. RENT A SCOOTER (Bike: 150 baht, Full tank of gas: 50 baht). This doesn’t exactly fall under “daytrips” but it is the best way to get to one. It can be a bit daunting to drive at first considering there aren’t really any rules here; sudden stops, no speed limit, people popping out of absolutely nowhere… Basically every mother’s nightmare (sorry, Mom). If you are aware and careful you’ll be just fine. Plus, it’s like playing real-life Mario Kart! All the bikes line up in front as the stoplight counts down.. 3-2-1…zoooooom! I can say I finally fulfilled my dream of being Yoshi, minus the egg droppings. Actually, a guy in front of me today was transporting 30 dozen eggs or so (you’d be amazed with what a determined Thai can fit on a bike), so he probably makes a better Yoshi than me. Do note that Thai police sometimes pull over foreigners as a money ploy. One time my ticket was 200 baht, the next day I was told 500 but when I pulled out the 100 and something-odd change I had he grumpily took the 100 and walked away. Once someone made an officer laugh and was off the hook so maybe just learn a little Thai comedy and you can avoid a ticket altogether. 6. ART IN PARADISE: ILLUSION ART MUSEUM (400 baht, can be 300 baht through hotel). Don’t let the price deter you because this is a place of pure fun. We spent a few hours posing in front of the pop-up-esque artwork that ranges from dinosaurs to Egyptian ruins and snowboarding to waterfalls. 8. NIGHT BAZAAR. This market is massive. There is a main street to smaller streets to little buildings that lead to other streets where somehow you end up in a courtyard to more streets. The items are cheap, the food is good and it’s nice to wander and get lost in it all. 9. TEMPLES. 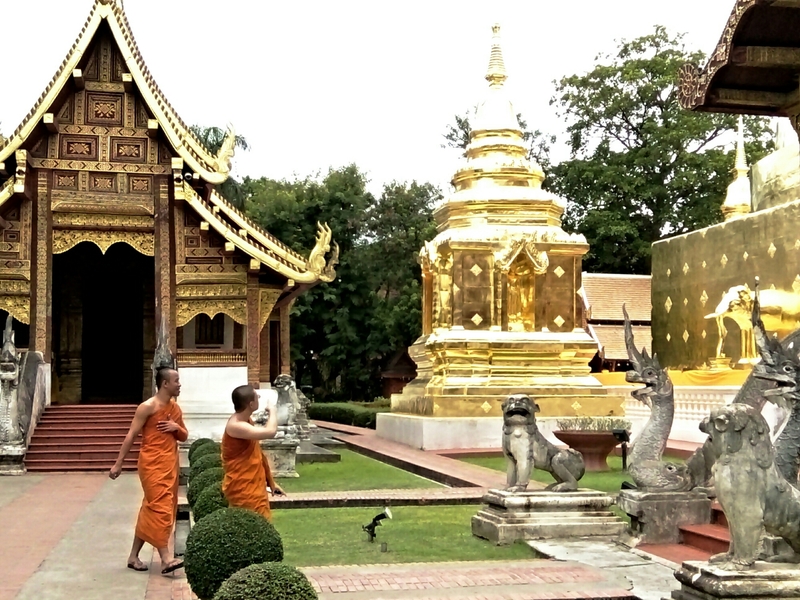 With 300+ temples in Chiang Mai it is harder to avoid temples than to find them. Wat Chedi Luang (pictured left; 40 baht) and Wat Prah Singh are the most popular and I also liked Wat Chiang Man (pictured right; free). 10. CAFES. Much to some people’s dismay, I am also a self-proclaimed coffee lover and Chiang Mai kept me quite satisfied. Coffee is legitimately everywhere here. 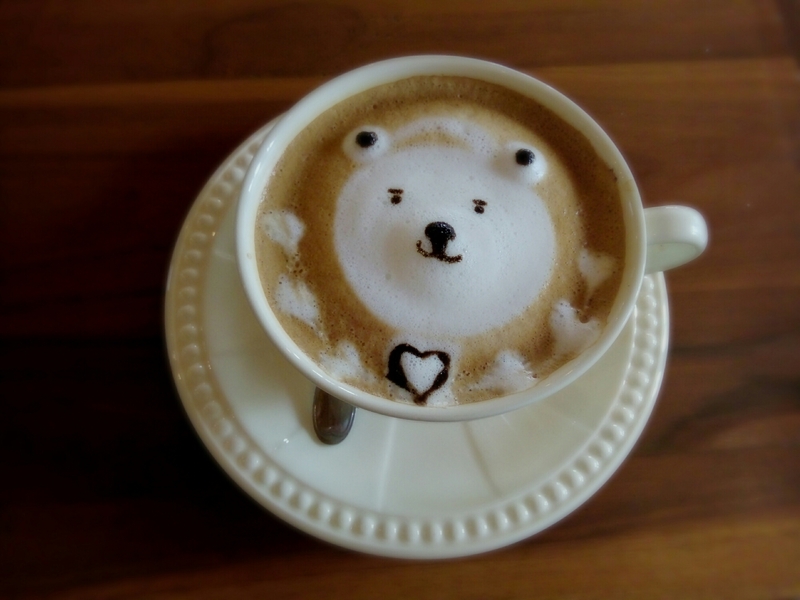 I loved the Bear Hug Cafe, Free Bird Cafe and Dada Kafe (which has amazing juices, too).